Former star South American galloper, Catch a Flight (5h Giant’s Causeway x Callaia, by Lode) continues to excel for his new trainer, the Argentinian bred claiming victory in the Grade II Californian Stakes at Santa Anita on Saturday. A winner of six of his first 10 starts in Brazil, Catch a Flight is now with Richard Mandella and showed his class overpowering smart types including Grade I winner Moreno to win this 1 and 1/8th mile contest by half a length. Catch a Flight has won nine of 15 starts earning over $393,000, but connections have bigger goals in mind. “We figured he’d be off of those two [Big Cazanova and Moreno],” Richard Mandella said. “Then it was whether he could catch them or not. When [Gary Stevens] goosed him at the quarter-pole, he responded pretty quickly. Gary knows him well enough. I didn’t try to tell him how to ride him. “This was a step forward. The time of the race was good and he beat Moreno. Every step he’s made has been forward. 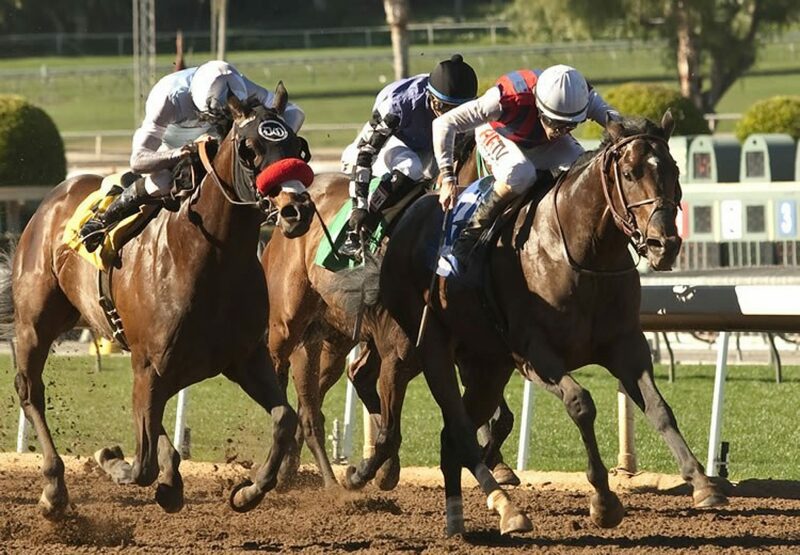 “We’ll look at the [GI The] Gold Cup [at Santa Anita June 27] next.” Catch a Flight is the best of four winners from Grade II placed Lode mare Callaia.